Perceptions: humans have many, few lack reality. Nevertheless there is one immutable life form we can depend upon for loyalty and the purest of love; our dogs. Their perceptions live in this very moment, never in the past or thoughts of the future. For many humans, dogs fill the most basics of our needs; permission to be ourselves and to be loved. Perceptions: gaze upon this picture, what emotions stream forward? Is it hate, sadness, compassion, some might be merciless in condemnation, others might feel remorse. What we humans lack is a dogs’ best character. We humans carry an entourage of our past on our backs into all relationships and life. Today, this moment, is to remind all of us of dedication, loyalty and love. What will be the immediate emotions and thoughts? How deep do we allow ourselves to experience? How much do we care in our so ordinary worlds? When passing by a person on the streets, do we turn our eyes in fear, looking away, feeling disgust or do we blame and complain, disgruntled at what some consider lesser than human? What are our perceptions towards other humans, many whose only caring partner is a dog? Most Homeless people give a better home to dogs than those who have homes, per ratio. And yet, they are not allowed to adopt a dog from a shelter. Dogs want loyal owners, and not to be abandoned. A dog, lives in the moment! As do all animals. Dogs do remember longtime friends, family and other animals over many years. They have deep embedded emotions, they grieve, experience loss to their core – but they move on giving years of loyalty to their owners. The first basic ingredient we all require after our first breath, is care. This inaugurates our instincts – our basics in survival. Humans require stirring of our hearts, touching of our hands – the softness of our skin, sensing with our eyes and ears. We are kinesthetic. We sense danger, calmness – wonder about our next response or action. Animals are also kinesthetic however, they do not project into the future of what may happen; they respond only to the immediate of circumstances, engaging their instinctual knowledge. When looking at each photograph, a sword pierces my core filling my senses with a myriad of feelings, from wonderment to crushing hopelessness, remorse and gratitude fill all senses. The meaning of animals in my own life, and for many – this one legacy of loyalty is the only companion a person might have in their world, the only loving being to cling to. These words produce one question in my mind; do we care? Our dogs will bestow loyalty, acceptance, companionship, respect, and kindness, never ending friendship – all precious legacies without request, never failing. [Featured Photo] A man with his only companion, a Shepard, solemnly held in his arms. The man’s face is worn from where life stripped him of his dignity. But to his dog, he is more worthy of acceptance, he is worthy of care and love. Humans’ judge! A dog accepts! 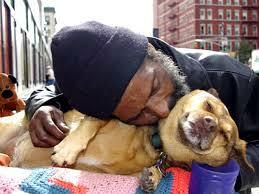 His dog does not care if they do not have a home, or if they smell from the dirty streets. All that matters is that they are together, warming each from the cold, and maybe a meal. Can we humans do that for each other? I wonder. How do we pass people on the streets whose lives have fallen through the cracks, the holes we create as a nation? Do we utter helpful words or do we look the other way as if this person were soulless? Does he not warrant our attention? He is homeless, does he not merit the same comforts – food – shelter? Or do we grumble some vile complaint? Do we acknowledge over 35% of the homeless are our veterans, (2014 stats where 49,933 homeless) who have come home from war wounded internally, who have seen and experience atrocities we cannot bear to hear or speak. We treat our homeless the same as we dare not speak of war, we pass by without a glance of their wretched anguish. Their dog accepts the forlorn without judgment. Some of us may serve a meal on Thanks Giving and smile, give ourselves a smile of gratitude for offering some coins or bit of paper called money. Does this gesture equal what their dog’s give moment to moment? Did this man fight in a war for our freedom? Are we willing to admit, our restaurants and grocery stores dispose of enough food on a daily basis to feed the entire worlds’ population three meals daily? Here sits a face of despair with his loyal dog, most likely both hungry and cold. Does it touch your heart or exacerbate anger? Do we ever stop our busy lives to ask the person on the street; how may we help you? Do we care for our humanity? Many would say yes. “What do you do for humanity?” Silence fills the air with awkward rumblings. Could we share one morsel of this kindness with a tattered stranger sitting on the ground? I have crossed this U.S. continent three times on my own with my dogs. The homeless population of people and animals has grown over those 30 years. Shall we judge the strength and loyalty of our nations by the population of our hungry and poor? It seems more truth bearing. Animal shelters bulge at the seams with unwanted pet, some euthanize 80% or higher – a nice term for “kill shelters.” How is this a shelter? And yet our pet industries are an annual 9 $Billion dollar income commerce. The cost of wars are in the trillions. Who benefits? How do we give back to dogs and humans when life has taken a devastating detour? None of us are alone, there is always a traveler beside us when accompanied by a dog! A single man and his loyal dog, slumbering along a dirt road in fall. The grass has dried, he wears a long pony tail, suede boots with fringe, gloved hands and an old comfortable winter jacket. A hat showing years of wear, for it has grown its own shape fitting his head. He walks with a loose lead alongside his dog, down a peaceful road somewhere on some continent. A calm walk down a country dirt road, watching a man and his dog may evoke an array of emotions. Many might find it exceedingly lonely. Some find a calmness – others might see the beauty of the quiet country while others find the land to be austere and lifeless. 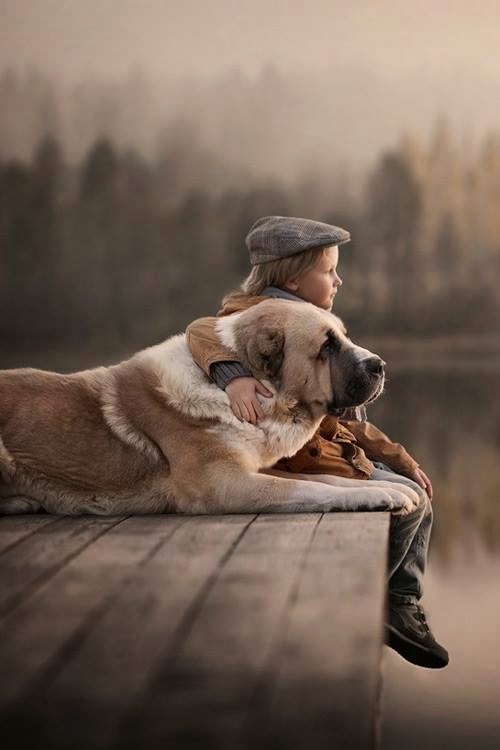 A boy and his dog sitting on a dock by the water’s edge, somewhere. What do we see? Possibly a lifelong formation of a relationship? Something we cannot see, we can hope and dream only for. We can see the calmness of the waters, a young boy viewing the simplicity of life, the spender of a chilly fog basking in the morning sun as it rises for the day. A quiet time in thought of what young boys think. A loyal equally calm dog beside him. For all the wonders that dogs have brought us. The K-9 service dogs offers in protection through wars and homeland police duties. Search and rescue dogs who feel immense pain when hope has been lost in not finding survivors from earthly or other disastrous calamities filling our world. The Service dogs who sits alongside a child while convulsing from a seizure. 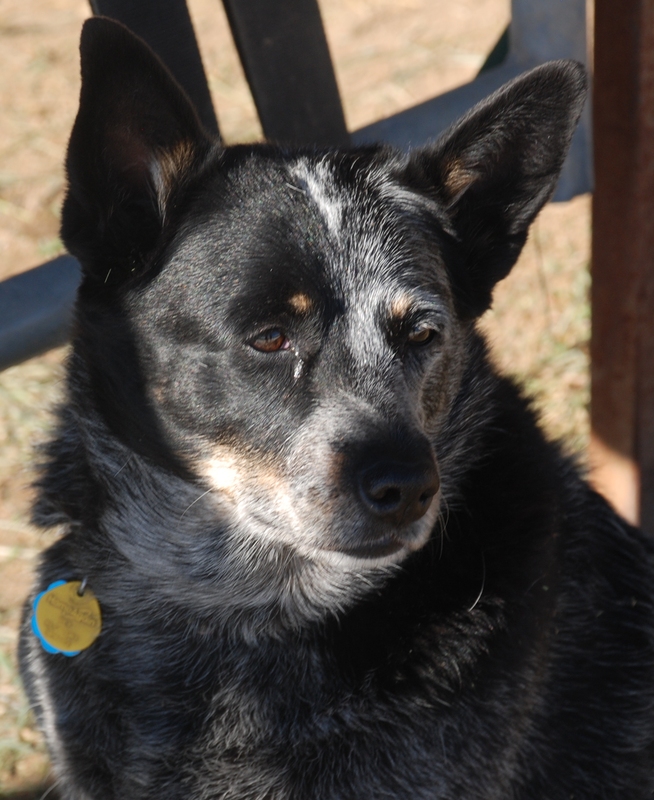 Dogs who pinpoint with their heads, targeting the area of malignant tumors. Dogs who remain calm beside their owner when they experience amnesia episodes; the dog might be the only recognizable being in their life at that moment. Recognizable by the loyalty and love or the soft acceptance from their eyes. 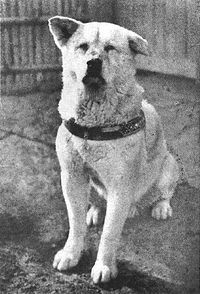 Hachiko is a true story, a Japanese Akita did not know his owner a professor had an aneurysm and died. Hachi waited nine years for his owner to return at the train station. This is the last picture of him taken before his death. Is it even our planet which our lives depend upon? What will you do the next time there is a stranger on the streets, alone with a dog? Animals have no judgments, they only know a singular moment when they are with a human they love. This is my Sädé, I am the fortunate one to have found her at the Buddy Center in Castle Rock Colorado 9 years ago. I trained her to be a Service dog, to work alongside with me, she has given me more love than any one human has given. March 13th is Veterans Dog Day, please do not celebrate as many do on our War Veterans’ day by guzzling beer at a barbecue. Please consider adopting a pet for “life, their life.” And some day we might make this day, a National Memorial day in Honour of All Dogs. And Veterans Day, a true remembrance of those who fought for peace! While we cannot adopt a person, we can help and consider that person on the streets as human, who has been left behind. Please adopt from shelters, take care of your dog, feeding them nutritious food – bringing them in from the cold and lonely dark nights. Please do not be a bystander, help – take some initiative to lift the Pit Bull ban in your state. Be a responsible loving owner. In short “give a damn!” Most of all take a lesson from our dogs, and care about humans of all kinds from around the world; Dogs do! It’s very effortless to find any topic on the web, I found this post on this site and am pleased. Sade is a very beautiful dog! Thank you Sharon,she is very loved by many people!